If you use makeup-removing wipes, then you’re probably used to how easy they are to use and toss, making your nighttime skincare routine a lot simpler. But did you ever think about what makeup wipes are made of, or what impact they have on the environment? Maybe it’s time to look at your skincare a little more closely. Made from our favorite fiber, Swisspers Cotton Makeup Removal Wipes pack a whole lot of punches that make them unique. They’re made from 100% ultra-soft cotton, which is naturally hypoallergenic for sensitive skin, and easily biodegradable. These wipes are pre-moistened with a pH balanced solution that is free of parabens, sulfates, phthalates, alcohol, fragrance, and oil: how Mother Nature removes her makeup. In fact, this cotton wipe contains other natural, skin-loving ingredients, like aloe and chamomile extracts, glycerin, and Pro-vitamin B5, making it perfect for those with sensitive skin. It’s also suitable for those who wear contact lenses. No runny eyes here! Swisspers is proud to use cotton because it’s a plant that gets stronger when wet. 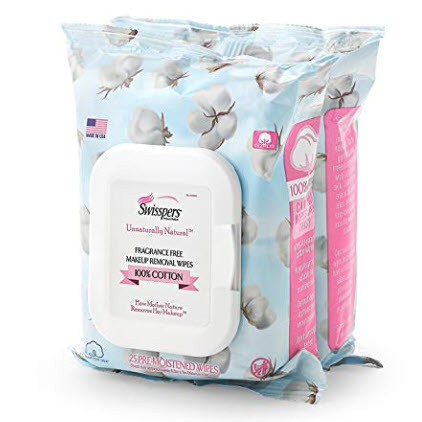 Cotton’s natural ability to absorb water makes it the perfect fiber to create a cleansing, strong makeup wipe gentle enough to use every single day, and since the wipes are also biodegradable, they’re good for your skin and the earth. Swisspers has truly created a different kind of makeup wipe, one you can feel good about using on a daily basis. They’re made from domestically grown cotton and also manufactured in the United States. Get your very own package of wipes here, and try them out for yourself.